Thunderbird by Mozilla Thunderbird & Outlook by Microsoft, are both extremely notable email applications. However, there is just this one difference that brings a lot of difference between them. Unlike Thunderbird, MS Outlook serves more than just emailing. The client is also known as a Personal Information Manager for its capability of letting users create and manage their personal data. This has majorly led a number of Thunderbird followers to opt for Outlook as their preferred communication platform. This is why user queries like ‘how to import Thunderbird mail into Outlook 2013’ have been taking a lot of rounds online. As a result, this segment will be offering more than one such way to ensure that all your desired emails are successfully migrated into Outlook 2013 or any other version that you choose to work with. Before you proceed with the migration of emails, know that the solutions will be divided in two categories; manual and utility based. NOTE: Not all methods guarantee representing a perfect outcome. These methods are preferable when a countable number of emails are required to be transferred. In both the methods, the output will be generated in an EML format file. Using these programs will give you the choice to either transfer selective or bulk of email messages from Thunderbird. Saving emails as EML, HTML, Plain Text or CSV will let you import them into Microsoft Outlook 2013 by simply dragging and dropping the messages in an existing/newly created folder. 2. Third Party Converter: Owing to the rapid rise in the queries demanding a guaranteed and dependable solution to know how to import Thunderbird mail into Outlook 2013 a large number of third party applications have emerged in the market. You can go for the one that comes with a freeware testing version to make sure it’s worth investing. Conclusion: On planning to go for a third party application, one can go for MBOX Converter which is also known as Thunderbird to Outlook converter. It can auto detect the MBOX source platform profile and let you convert emails from it to Outlook PST file. The added convenience and quick results that this tool provides are incomparable to any of the methods listed above. My name is Stephen Ronald, an IT guy and working for a software development company. 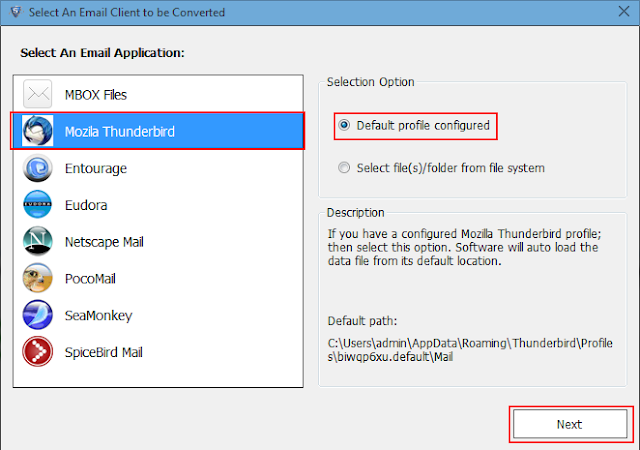 I have explained several methods to do the task and Thunderbird to Outlook Converter is one such prominent solution which explores how to import Thunderbird mail into Outlook 2013 & other versions. Scheduling tasks is important to get things done on time. People who’re busy managing day to day tasks can make use of online appointment tool to handle appointments as well as lets your clients schedule time to meet. The best part is, you can manage or escalate these appointments as per your convenience through a common dashboard. 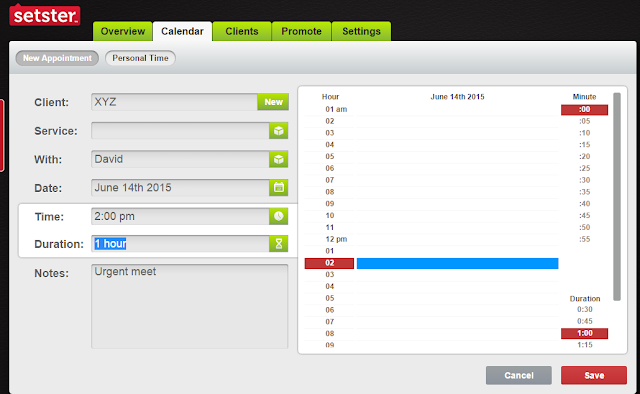 Setster is an easy to use and must have tool for every business where scheduling things is crucial. All you need is, internet access at your work place or at home to accept bookings. Business owners also has the capability to manually enter appointments as per the query they received over phone or in person using extremely easy to use Setster dashboard. You’ll need to choose any convenient package (Don’t worry, Setster offers 15 days free trial period) available at Setster website https://www.setster.com. After filling all the details, you’ll be taken to payment page. Complete the process and you’ll be provided login details to get your own personalized Setster Dashboard. With simple and interactive interface, you merely take minutes to understand how thing works. As in the screen above, you can see the current month calendar along with all the major options at the header menus. To book appointments, simply click on ‘New Appointment’ button located just below the ‘Calendar’ menu at the header. You’ll need to enter few basic details and you’re good to go. Click on ‘Save’ to finalize the appointment. Setster lets you add long list of clients through ‘Add Client’ interface. You can further alphabetically categorize your clients or speed look up for targeted client. With the settings interface, you can further customize your Setster dashboard or complete your profile. An appointment button will be placed at middle on the left side of the middle to locate appointments close to your current location. Easy to understand and self-explanatory interface makes it easier to understand and schedule appointments. You’ve full control over accepting or adjusting scheduled appointments as per your free time slots and intimate your client in the meantime. Setster would be the perfect solution for businesses to schedule payments with integrated payment module and map features. You can find much of the functionality in Google Calendar but still, there are many things you may found missing which Setster lets you flawlessly use. Use of Setster is varied as per your need and may fit perfectly as per your business needs. Go ahead and give it a shot to taste its benefits yourself.